You can huff and puff, but you can't blow this [greenhouse] down. -- Larry Meiller of Wisconsin Public Radio. Everything old is new again by rehabilitating the timber-framed, south-facing corn crib/granary used for agricultural purposes. 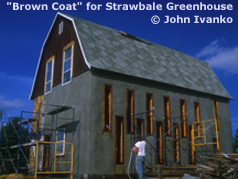 As of December 2002, the first phase of an active solar-heated strawbale greenhouse is completed, keeping true to the agricultural use of the structure. South and some west-facing walls will contain insulated glass glazing with the remainder of the structure in-filled with strawbale and covered with 2-inches of cement-based stucco on the outside and 2-inches of clay-based stucco on the inside. Various recycled materials have been salvaged for this project, including collecting wood, old metal doors, and windows destined for landfills. Completed through a 2-part workshop, sponsored by the Midwest Renewable Energy Association (MREA), and with the incredible assistance and contributions of friends, neighbors and others in the community who joined in our efforts during the summer or "straw bale September 2001." Jason Perry, among the many who pitched in during the fall, took some amazing photographs of the straw bale construction process. The project was managed by Matt Sterling, owner of Native Earth Construction of Amherst, WI, who was also the workshop instructor. replicability and feasibility as a demonstration of "green architecture," in the words of Amory Lovins and William Browning: architecture that embraces the efficient use of energy, water, and other resources; helps protect habitats, wildlife and cultural resources; utilizes non-toxic building materials to provide a healthful indoor air quality; and finally, fosters an integration of work, habitation, agriculture, sensible land use, and transportation and related issues. 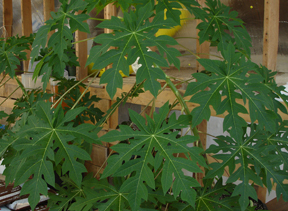 Over the years, we've grown papayas, banana, coffee and other tropical fruit and plants. Today, it's used to germinate seedlings in the spring, cure garlic and onions in the summer and store our numerous books. The greenhouse serves as a demonstration project for family farmers looking to thrive in an increasingly challenging economic climate. Unless small farmers can find new or alternative markets for cultivated or value-added crops, the current trend will continue with lost livelihood, lost farmlands and lost agriculture. At Inn Serendipity, we've embraced Wisconsin's "cottage food law" with value-added sauerkraut, relish, pickles and shurb. Here's our Inn Serendipity cottage foods listing on Forrager.com. This project demonstrates the feasibility of retrofitting an existing agricultural outbuilding into an energy-efficient, sustainably-designed greenhouse. This is the first known project retrofitting a corn crib/granary into an active solar-heated strawbale greenhouse. A fact sheet on the design was developed for reference. In many ways, the project was also inspired by the father of "organic architecture," Frank Lloyd Wright who lived in nearby Taliesin, Wisconsin. We strived to have the building embody Wright's "architecture of democracy:" architecture designed to serve the purposes of a community of self-reliant individuals working together, in harmony, with nature. And there is, too, organic architecture: architecture attuned to nature, exemplifying humandkind's development within nature.